Nationalism in the arts can be seen as a contradiction in terms. Paying homage to the nation state requires acquiescence and acceptance whereas artists by their very nature are rebels and scrutinisers. Can the idea of a nation state still appeal to their sentimental and nostalgic sides? Can they see ‘nation’ as evoking the notion of ‘home’ — a place where sameness ensures security, values remain pure and change, or foreignness, is kept at bay? Historically, there have been many manifestations of nationalism in art. Sometimes, these have taken the form of images of power, often with allusions to divine approval. An iconic example of this category of nationalistic images would be Eugene Delacroix’s Liberty Leading the People — an image steeped in nationalistic fervour and employing a distinctly assertive vocabulary of nationalism such as the charging, allegorical figure of Liberty and the tricolour flag of the French Revolution. At other times, artists have looked to imagined versions of the past to express nationalistic sentiments. A large number of artworks in this category see the bygone days as being free of foreign influence and permeated with a simplicity that brings out the essence of a land and its people. This approach to nationalism – involving retrospective editing in an attempt to dig out the true extract of a people – can be found, for instance, in the yearning for the past that characterised the works of the Pre-Raphaelite Brotherhood in 19th-century England. The Pre-Raphaelite painters and poets, by idealising a time before Raphael (and prior to the advent of the tenets of the Italian Renaissance that Raphael came to embody), helped revitalise Arthurian legends originally recorded in Thomas Malory’s 1485 book, Le Morte d’Arthur. For the Pre-Raphaelites, the quaint figures of Arthur and his knights symbolised a heroic English past. 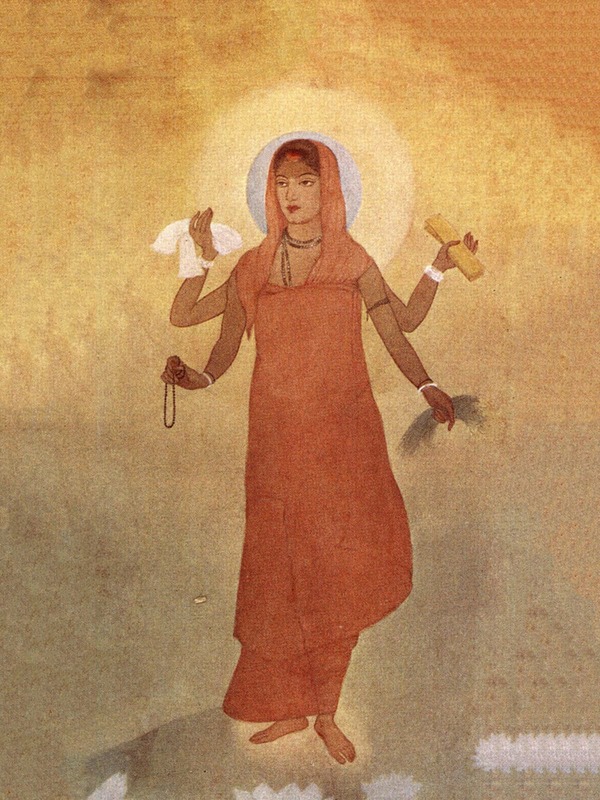 Half a century later, anti-colonial nationalist sentiment in India manifested itself most famously in Abanindranath Tagore’s painting Bharat Mata – a delicate, watercolour depiction of Mother India, saffron-clad, stately and carrying in her four hands objects symbolic of self-sufficiency that Indian nationalists aspired to. Tagore, much like his nationalistically inclined counterparts in other parts of the world, was cutting through layers of imposed or fictitious ideas of Indianness to reach what he thought was an authentic Indian identity. His painting style defied the European academic realism and incorporated influences from Mughal and Rajput miniature paintings as well as from ancient Buddhist monastic art from the caves of Ajanta (in today’s Maharashtra state in India). These influences became the cornerstones of what came to be known as the Bengal School of Art. But for all the strength and promise possessed by works such as Bharat Mata, they also reflect what is wrong with adhering to a unitary nationalist ideology. For one, such an ideology precludes difference and diversity. Bharat Mata was predominantly a Hindu image, fashioned after a Hindu deity, even though it was a product of various strands of inspiration. As such, it could not function effectively as a nationalistic symbol for the minorities of the Indian subcontinent. Historical and cultural legacies are hardly simple matters and that is why nationalism can be dangerous — it treats them as if they are. Take Pakistan, for example. What is our legacy? How far back do we reach into our past to claim something we can consider genuinely Pakistani? In the wake of independence from the British rule, Abdul Rahman Chughtai turned almost entirely to the Muslim literature of the Subcontinent for artistic inspiration. He had already begun, in the 1920s, to detach himself from the Bengal School, going so far as to champion the idea of a Punjab School of Painters, comprising primarily of Muslim artists from Punjab. In his disinclination to be assimilated into a larger, and chiefly Hindu, artistic movement, we can read a prologue to the partition of the Indian subcontinent. 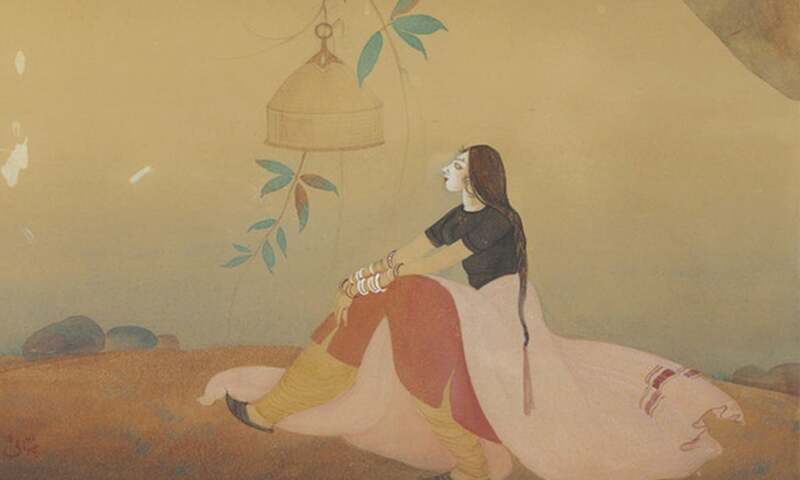 But Chughtai was, in the words of the late art historian and critic Akbar Naqvi, “his own beginning and end”. 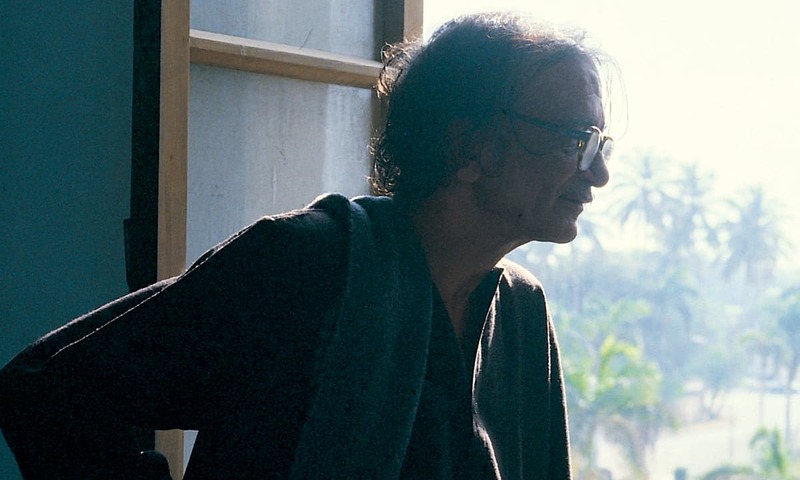 Post-independence, his work, or any nationalistic strains it carried, did not reflect the larger artistic trends in the newly-established Pakistan. Many of the artists working in Pakistan at the time were grappling with individual artistic concerns and there was hardly any move towards a collective, patriotic art production. Even art education in early Pakistan, unlike that provided in state-sponsored or public sector art schools and academies elsewhere, did not endorse any nationalistic or propagandist agendas. The country’s premier art school, the Mayo School of Arts in Lahore, took a pedagogical course that remained independent of the state’s ideology. It was rechristened as the National College of Arts in 1958 and its first Pakistani principal, Shakir Ali, took up office in 1961. Apart from these two developments, no evident pro-nationalistic changes were introduced in the curriculum or the running of the institution. 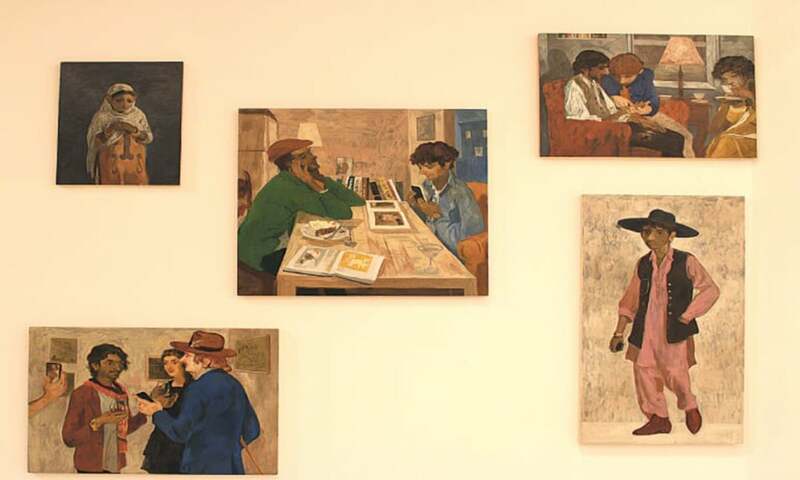 The department of fine arts at the University of the Punjab, too, facilitated a breadth of artistic experimentation under Anna Molka Ahmed — who was born in Britain but was married to a resident of Lahore. In many ways, as is evidenced by contemporary Pakistani art, this eclecticism is as close as we have come to attaining a ‘national’ idiom. It is perhaps because of this eclecticism that there is little artistic content that can be classified as purely nationalistic. There are only a few and sporadic instances of patriotic art and these, too, are mostly limited to official, commemorative artworks. 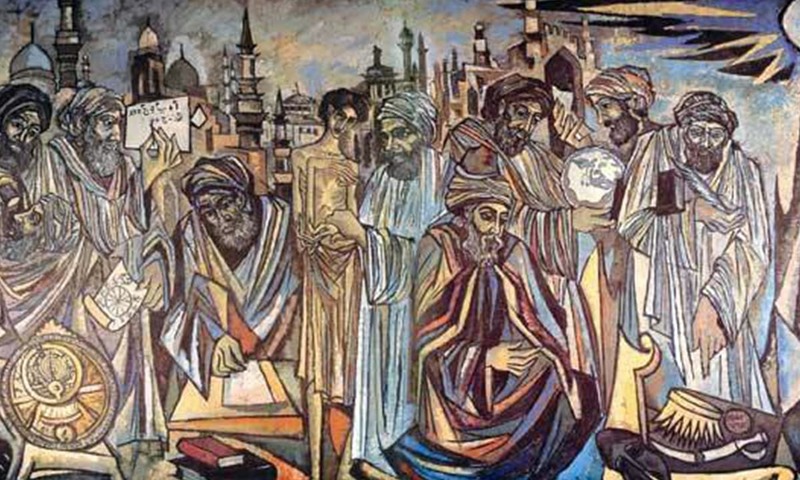 Even in this category, the work of Sadequain – who was engaged by multiple state institutions to create artworks at public buildings and monuments – was humanistic and universal in its imagery and values, and syncretic in style. On the other hand, Pakistani artists have never shied away from critiquing conventional ideas of nationalism. From Abdur Rahim Nagori’s satirical paintings targeting the country’s military regimes to Salima Hashmi’s smoke-filled and fractured worlds symbolising life under oppressive governments, numerous artists throughout the last seven decades of Pakistan’s history have pointed out what is wrong with the puffed-up, jingoistic narratives peddled by the various faces of the state. Pakistani artists today continue to ask questions and provoke debate through their works which, like most contemporary art, steer clear of nationalistic leanings. In Contemporary Art and Nationalism – Critical Reader, artist Minna Henriksson and theoretician Sezgin Boynik comment on the awkward relationship between art and nationalism. “Drawing a connection from contemporary art to nationalism is in many ways complicated and problematic,” they write. The reason, according to them, “lies in understandings of contemporary art as a practice that is subversive and critical, which questions mainstream ideas and conservative thoughts”. Contemporary art of the 20th century (ranging from the avant-garde to conceptual art and up to the present) in its fundamental definition, according to the authors, “is assumed as an obvious negation of pre-described and fixed ideological formulations, of which nationalism becomes among the most visible examples”. Contemporary art, they say, is “international and cosmopolitan” in its character. It is this cosmopolitanism that defined some of the most celebrated art events in Pakistan during 2018. The Lahore Biennale, the second of the country’s first-ever biennial exhibitions, took place in March last year and it was anything but nationalistic in character even though the Punjab government was one of its sponsors and it utilised many historical sites of national importance for displays. The biennale, instead, reinforced a sense of regional solidarity by way of certain exhibits. An exhibition, titled Invitation to Action and curated by Mariah Lookman at the Mubarak Begum Haveli as part of the biennale, for instance, paired the quiet intensity of works by different South Asian artists with the modest grace of a Shia place of mourning. The choice of works and the site spoke of the need to look at stories from the margins, a point emphasised by the show’s title which came from a story in Saadat Hasan Manto’s collection Siyah Hashiye (Black Margins) written around the time of Partition. The practices surveyed – which included those of Lala Rukh and Zahoor ul Akhlaq (from Pakistan), Minam Apang (from India), Rasel Chowdhury (from Bangladesh) and Muhanned Cader and T Shanaathanan (from Sri Lanka) – were all underpinned by what Lookman in her curatorial note called a “political agency”. All the artists whose works were displayed at the site have engaged, in one way or another, with the past, the present, and the probable future of their rapidly changing region. Curated around common regional concerns, the exhibition seemed to eschew the very idea of borders and inwardness. In fact, the artworks carried no names or labels when they were first opened to the public. If one was not already familiar with the work of the individual artists featured, one could not easily distinguish between them. The viewer had no choice but to experience them as a single resonant note. National identities coalesced into a larger, and more significant, regional identity. Similarly, nationalism was both presented and critiqued at another important venue of the biennale — the Lahore Fort. Here, Fazal Rizvi’s installation, The Dead Tigers of British India, had an unmistakeable anti-colonial nationalistic expression. 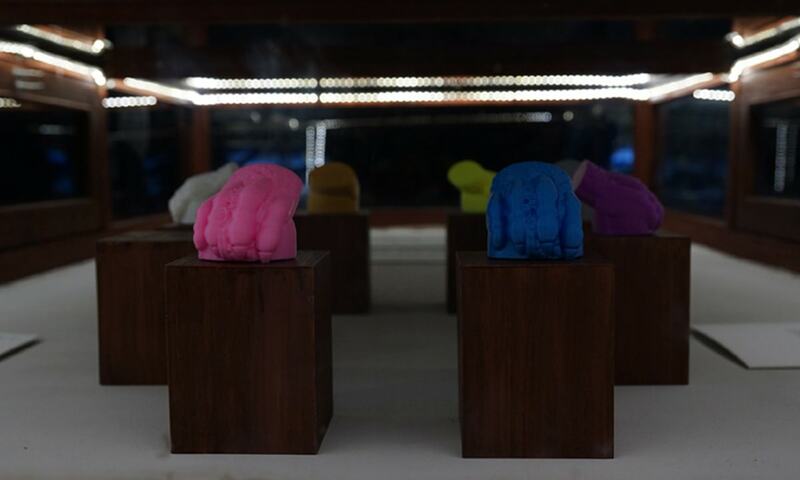 It comprised archival material from the annals of the British Raj, seven fluorescent tiger paws (modelled after, and lamenting, the eight plundered paws of Tipu Sultan’s famed tiger-throne) and the artist’s own verbal protests against the ravages of the British Empire. Through the resuscitated figure of an early Muslim freedom fighter and the allegory of the tiger hunt, Rizvi denounced the colonial rule and commemorated one of the earliest instances of nationalist resistance to the British occupation of the Indian subcontinent. At the same site, the standard vocabulary of nationalism was obliquely criticised through Imran Qureshi’s installation comprising numerous sprigs of green optic fibre. Crammed into a chamber lined with mirrors, the eerie, glittering bouquets seemed to stretch as far as the eye could see. The use of mass-produced optic fibre lamps, which emitted an artificial and ominous green light, seemed to question the idea of green fields, pastures and valleys — used in everything from children’s literature and patriotic songs to pop culture and advertising as an expression of the beauty of one’s land and one’s love for one’s land. The installation, titled The Idea of Landscape, was informed primarily by an environmental concern but it could also be seen as offering a comment on patriotic hyperbole. At the Lahore Museum, yet another venue for the same biennale, Bani Abidi’s Memorial to Lost Words demanded justice for the forsaken Indian soldiers of World War I through an audiovisual presentation that had at its centre a statue of Queen Victoria. The audio consisted of a poem by Amarjit Chandan, based on, and inspired by, letters written by Indian soldiers serving on the western front during the war. These letters were frantically censored by the British in an attempt to suppress any anti-war sentiment and dissent from spreading. The work challenged the imperial propaganda and made a powerful and reverberating case for the censored voices of the past. Salman Toor’s installation of paintings at the Alhamra Art Gallery, also a part of the Lahore Biennale, pointed to another problematic aspect of a single national identity. Where and how does the diaspora fit in? In today’s closely linked world in which travel and cultural cross-pollination have become both easy and complex, how redundant do ideas of borders and nationality become? By juxtaposing snippets of life in Lahore with scenes and glimpses of life in New York City and by offering a mesh of cues – Pakistani clothes, western interiors, books in English, scribbles in Urdu, books in English on figures from Muslim history – Toor made it difficult to have a safe or tidy reading of identity. He, instead, compelled the viewer to imagine how an immigrant or refugee would interpret the idea of identity in today’s condensed world. Some collateral shows that took place during the biennale also brought attention to the perils posed by official narratives and orthodox histories. River In An Ocean curated by Natasha Malik and Abdullah Qureshi, for example, celebrated individuality and heterogeneity and examined ways in which difference can be owned and celebrated and space can be contested by and for the marginalised. The exhibition was curated at a warehouse in Lahore. The choice of the unlikely, partly industrial, space was a subversive act in its own. In a similar vein, I, Too, Am A Part Of This History, curated by Zahra Khan, brought together the wonderfully miscellaneous collection of a private museum (representing many chapters from Pakistan’s densely layered history) with a variety of new artworks that acknowledge the pluralism that is at the heart of Pakistani culture. Certain works from this show, such as Suleman Khilji’s Shabeeh-e-Yousuf Masih, emphasised, in particular, the plight of Pakistan’s minorities and, in doing so, offered a critique of statist Islamic nationalism. Besides the Lahore Biennale, a few other shows that took place in 2018 also visited or analysed the notions of nationalism, however implicitly. One of them, Sophia Balagamwala’s show BIG MEN WEAR REALLY BIG SHOES opened at Sanat Initiative, Karachi, in March last year. It featured a series of playful portraits of moustachioed men, decorated with epaulettes and medals, parodying in pastel colours the pomposity of office and the self-congratulatory nature of state portraiture. In a two-person show, How to Make a Contemporary Landscape, held at Lahore’s O Art Space in May 2018, artist Saba Khan approached with a quizzical eye the frenetic beautification of Lahore carried out by a government bent upon turning the city into a version of Paris. Through her drawings and photographs, she set about deflating the false sense of stability and well-being evinced by vacuous public monuments. By drawing Lahore’s largely non-functioning fountains in a loose and immediate style, their forms quivering with lopsided trails of water flowing from them, she rendered them – and through them the narrative that they are meant to support – as impotent and a little ridiculous. In April 2018, also in Lahore, a two-person show at Taseer Art Gallery featured Anushka Rustomji, who has been working with Zoroastrian and Mesopotamian motifs on the themes of historical and cultural overwriting, and Iranian artist Marjan Baniasadi. Titled Transition of Tradition, the exhibition created an ephemeral installation – Ready-made Ruin. 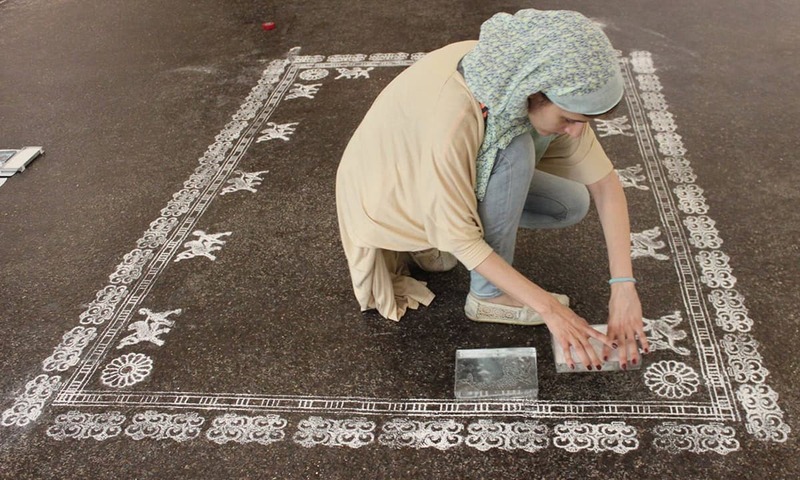 It comprised of a carpet with Babylonian designs traced out in white chalk on the floor of the gallery. For the duration of the show, visitors walked over the carpet, gradually erasing and turning unintelligible its patterns and form. In this transitory artwork, one could glimpse the tragedy of historical erasure, of sacrificing myriad cultural strains at the altar of one dominant world view and belief system. Taken together, 2018 was a year of confident experimenting and intrepid activism as far as the visual arts are concerned. A marked rise was seen in alternative and previously-less-explored forms of artistic expression – such as performance art – in Pakistan’s small but dynamic art sphere. Now more than ever before, artists are at liberty to create artworks and express themselves as they wish. They are not reliant on the support or patronage of the state. Social media has provided them with a platform for exhibition and exchange that is vast, unrestricted and resilient in the face of control and policing. And opportunities for them in the form of residencies, grants, curated and travelling shows, art festivals and other fringe events have blossomed with the rapid expansion of the international art market in the past two decades. These, in turn, have encouraged a global atmosphere of collaboration, exchange and critique. Contemporary art and its practices and procedures are, thus, essentially incompatible with any didactic and conformist agendas. Taking things at face value is not an option for artists any more — it never was. Research has become integral to art-making and it is neither possible nor advantageous for artists or curators to make and discuss art that is not backed by study and analysis. Most of the exhibits discussed in this essay featured works of, or were curated by, young practitioners who are looking increasingly at new and interdisciplinary, even informal, methods of art production and exhibition. Their projects are supported by texts, discourses and debates around historical practices. To cite just two instances of such innovation, Natasha Jozi – an artist who has founded House, an independent initiative to examine the city as a “performing organism” – curated Body Becoming, a one-day event comprising multiple performative works, at Lahore’s Olo Junction. In Karachi, a similar compilation of performance art, Mix Tape 1, was curated by Karachi-based artist Sara Pagganwala at the Canvas Gallery. It featured more than 20 artists. 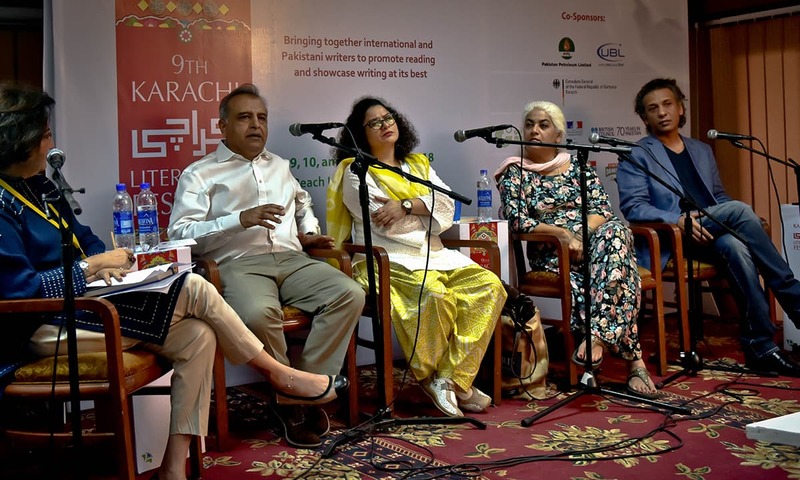 Together, these ventures into newer, less determinate and far-from-conclusive categories by Pakistani artists served to create a climate of openness and curiosity. This climate will, hopefully, help the generation currently coming into its own, to face, and possibly undo, the less savoury aspects of nation-building. The author is a visual artist and writer based in Lahore. Artists criticze national boundaries because they want money and recognization at the global level. Art in its imaginative free-floating imagination and creativity need not be and should not be confined to a region or seen through the prism of nationalism. Art is spontaneous, nation is often contrived and subject to historical accidents. And art is at least 35000 years old, but the idea of nationalism came out only after the French Revolution and just about 200 years old. Many painters, artists, writers, intellectuals died during Bangladesh Liberation struggle. @paul I hope you are bring sarcastic!!!! !